Spray the inside of an 8-inch springform pan with baking spray. Preheat oven to 350°F (325°F if using a dark non-stick pan). Place rhubarb in a few layers of paper towels. Squeeze and allow water to drain out. Repeat with new paper towels, if needed, to get most of the water out of the rhubarb. BROWNIE LAYER: Mix together the brownie mix, water, oil and egg. Stir rhubarb pieces into brownie mix. Pour brownie batter into an even layer in the springform pan. Bake for 32-38 minutes. Remove from oven and allow to cool completely. CHEESECAKE LAYER: Beat cream cheese until light and fluffy. Add sugar and beat until smooth. Stir in sour cream. Fold in the whipped topping. Spread the cheesecake filling over top of the brownie and refrigerate for at least two hours. STRAWBERRY-RHUBARB SAUCE: In a saucepan, cook the rhubarb and strawberries over medium-high heat, stirring often, until they begin to release their juices. Whisk together the sugar and the corn-starch, then add it to the saucepan. Bring to a boil, stirring constantly, then reduce heat to low and let simmer until the sauce begins to thicken. Stir in the lemon juice and lemon zest and cook for one for minute. Remove from heat, transfer to a bowl, and refrigerate until cool. To serve, remove the cake from the springform pan and set on a serving platter. Cut into slices and serve topped with strawberry-rhubarb sauce. You've probably had rhubarb in a pie, you may have even had rhubarb in a sauce, but have you ever even thought to put it in a brownie? I did, and the results were better than I would have ever imagined. With every bite, little pockets of tart rhubarb mingle perfectly with the decadently rich, chocolate brownie. Plus, the tiny pieces of stalk break down and become super moist once baked, making the brownie even more ooey gooey than normal. 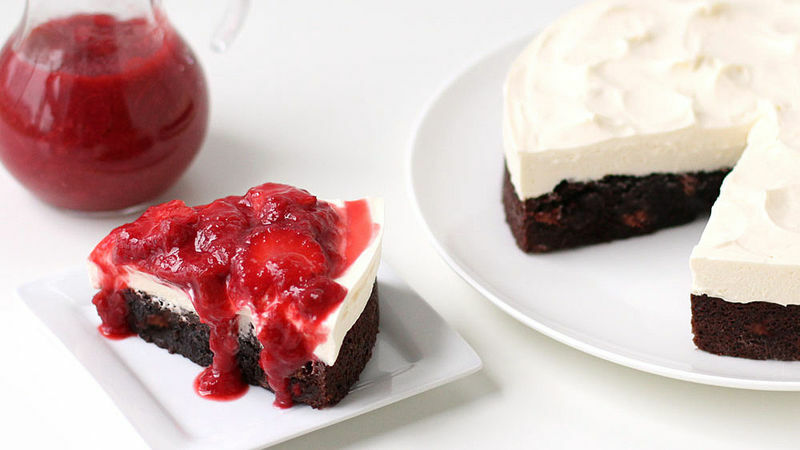 You can stop after you make the brownie, if you really want to, but I know you are going to want to top it with a layer of tangy no-bake cheesecake and some sweet and sour strawberry-rhubarb sauce. The end result is a decadently rich, slightly tangy, somewhat tart, and happily sweet dessert. When the cake has chilled, remove it from the springform pan and set it on a serving platter. You can pour the sauce over the top of the entire cake, if you want, or... you can cut and serve the slices, then pour the sauce over top. Serving it this way is a bit less messy but equally as tasty.